Who says we cant have OS X on without a MAC? ExploreFuture is here with a complete guide to transform your Windows to Mac OS X. You can see a screen shot of my desktop which was running Windows XP but now is converted to Mac OS X look. Its the closest one can get out of Windows. Follow these simple steps and you can get your Mac OS X. There are two ways to change your theme. 2. Installing Flyakite OS X Theme. I prefer to use Flyakite as its free while Windowblinds is not free. 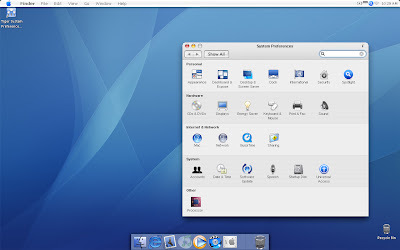 Moreover, you need to download Mac OS X Skin from other websites and also change your icons and cursors by yourself, if you are using WindowBlinds. After you install Flyakite, your XP will be having 90% looks like that of Mac OS X. The remaining 10% will be will come after you install the Finderbar. You can download the Finderbar from here. After downloading this Finderbar, just reboot your PC and then run the Finderbar Engine from Start Menu. Congratulations, you have now converted your Windows To Mac OS X. If you have any problems, then just write in the comments and I will be more than happy to answer them. download tune up utilities 2007 fix your errors...it might help you.